Well, here’s the bike. Again. Yes, I know, I’m still not wearing a skirt. I don’t usually, when cycle camping and touring. Although I will have one crammed into a tiny corner of one of my panniers. Just to throw on over a clean pair of cycling shorts in the evenings when I pop into a local bar or pub. Me and the hardy Roughstuff. Just broken camp in a field near Hardraw, August 2011. This was taken by a friend who accompanied me for a few days of my End to End in the summer of 2011. 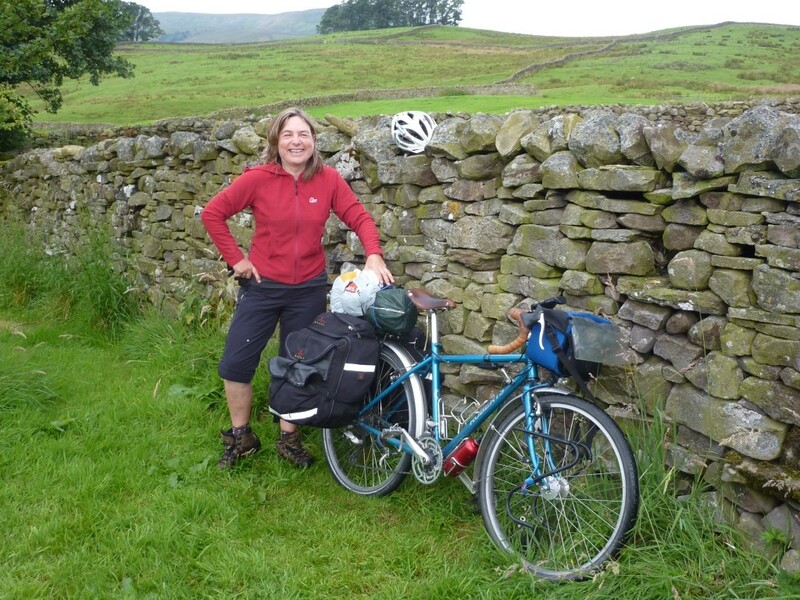 I met up with her when I reached York and we crossed the country, through the Yorkshire Dales and spent a long weekend just riding a few of the terrific roads in that part of the country. A mini tour within my much longer trip, that began four days earlier at Dungeness and ended, some 1000 miles or so later, at Durness on Scotland’s north west coast. So, those of you with some knowledge of the geography of these islands, will realise I didn’t exactly take a very direct route!